Does your business or organization have a need for speaking, event, or presentation furniture? 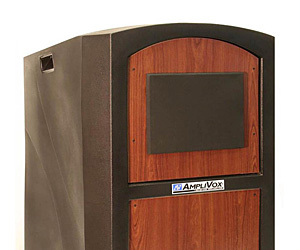 Our professional quality podiums for sale are available in 1000s of different styles and configurations to match the needs of almost any facility. 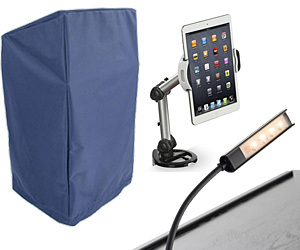 Our online warehouse offers in-stock inventory that allows fast, same-day shipping on most models, ensuring that speakers stands, trade show counters, and presentation lecterns are available when needed. 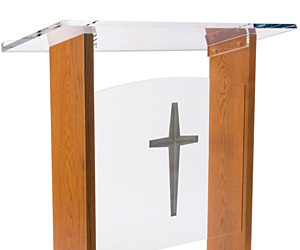 In addition to traditional podiums for sale, such as our classic wooden pulpits, our selection includes a variety of more modern designs. Clear acrylic, scratch-resistant lucite, and durable powder-coated metal fixtures not only bring a contemporary look to any facility, but also offer imprint options for graphics, business or church logos, and custom designs. Multiple sizes, finish colors, and accessories make it easy for schools, organizations, and professional operations to find the right speaking furniture for their needs at an affordable price. 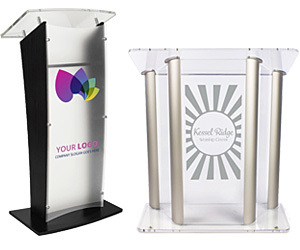 Specialty podiums with features such as built-in sound systems, iPad and tablet holders, outdoor-rated lectern design, locking storage, or pop-up construction are all available for easy ordering. 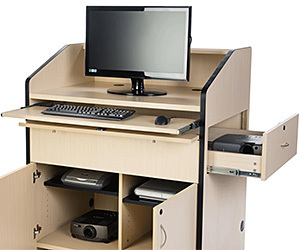 In addition, our selection of lectern furniture includes a full range of AV carts and stands designed to withstand daily use in medical and professional training environments or school classrooms. 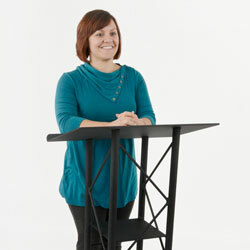 What are the most common styles of speaking stands available online at Displays2go? 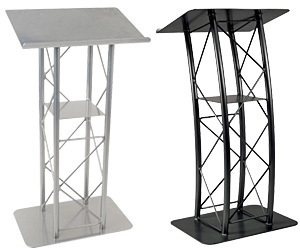 Our contemporary metal podiums for sale include elegant truss designs that bring a stylish look to any environment. 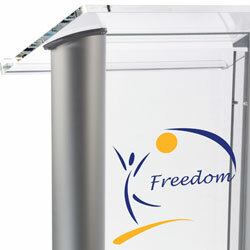 Modern acrylic lecterns offer clean lines and are easily customized to showcase custom logos, religious symbols, or brand images as desired. 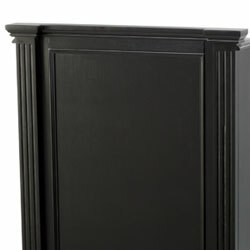 Traditional wood pulpits come in full size, height adjustable, and tabletop styles to match the needs of commercial and professional facilities, schools, or houses of worship. Specialty lecture and presentation stands range from standard fixtures with sound systems, graphics, iPad or tablet displays to AV carts with multple shelving and storage options. 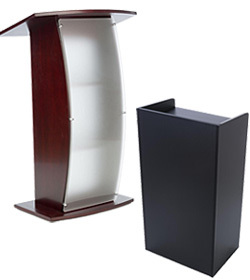 Most lecterns and stands offer a choice of customization options, as well as availability in different finish colors. Econonomy fixtures for sale for public and classroom training environments are also available in a wide range of designs. 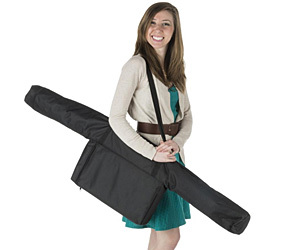 Our discount presentation podia often ship unassembled, allowing lower prices. 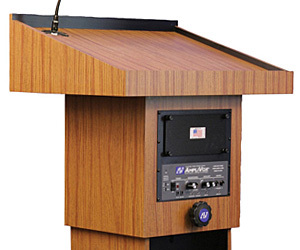 Cheap lecterns can also utlize lighter materials, such as plywood or cardboard, to reduce cost. 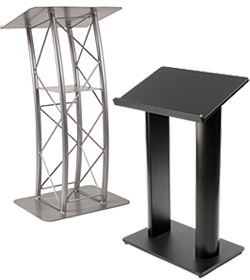 Speaker, presentation, and lecture stands are some of the most commonly used facility furniture pieces. Almost every operation, from schools to professional service businesses to churches and for-profit and non-profit organizations, needs to accommodate some sort of public address at one point or another. Many facilities, in fact, require versatile styles that can accommodate different or changing presentational requirements. Differences between models can be confusing, however, as in current usage there is no clear distinction between many of the types or terms. What is a podium? How is it different from a lectern or a pulpit? 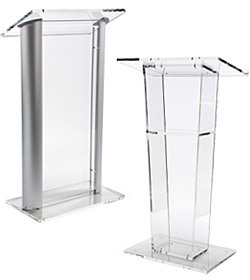 Podiums (or the more grammatically correct plural, "podia") were originally raised platforms upon which people stood to make public addresses or receive awards or accolades. Facility managers still use this meaning of the term. 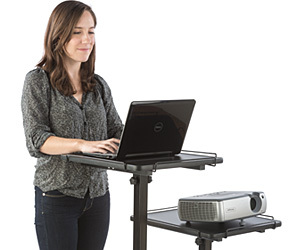 Current usage, however, often use the term to mean a reading stand that a speaker stands behind. 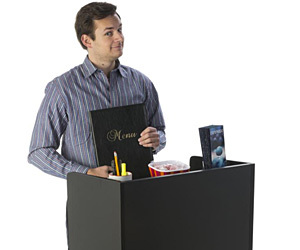 Lecterns are technically stands or desks with slanted tops designed to hold books or source materials. Originally this was a second stand inside a church for non-religious readings and was located on the opposite side of the pulpit. These fixtures allow lecturers, teachers, and professors to stand or sit behind them and comfortably read from texts or notes. Both full-size (freestanding) and countertop versions fall under this term. The first pulpits were elevated fixtures or areas from which sacred texts were read or religious sermons delivered in houses of worship. Modern usage of the term refers to stand from which lay and secular readings, lectures, and presentations, as well as clerical, are given. An ambo (ambones or ambos in the plural) was historically used to refer to a single stand that served for sacred and non-sacred readings in houses of worship. 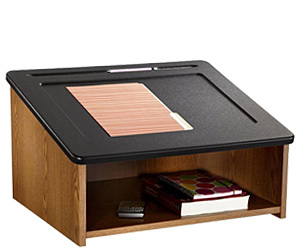 In modern usage is used for any raised surface used for holding texts, notes, or reading materials. 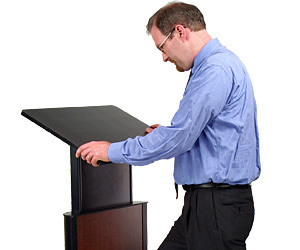 A shtender, like a lectern, is a full-size or tabletop stand for a book, commentary, or sacred text. A rostrum (plural: rostrums, rostra) is a raised platform for a single person, such as a speaker or conductor. An elevated platform designed to support multiple people is called a dias, or simply a stage. 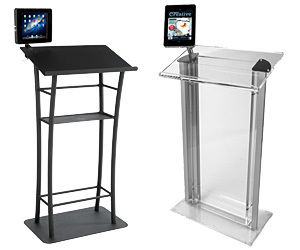 Lecterns, podia, and other reading stands are some of the most versatile pieces of facility furniture. 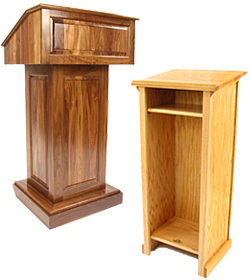 A single speakers' pulpit can serve for an awards banquet presentation, restaurant hostess stand, class convocation, sermon to a congregation, classroom lecture, boardroom meeting address, political speech, conference keynote, or debate... and those are only a small sample of uses. Designs and construction materials can influence the decision on which speaking stand is best for each purpose or environment. Our clear category breakdowns and product descriptions help buyers find the right match for commercial, professional, religious, and educational needs. 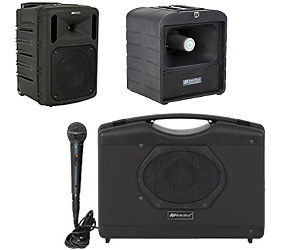 In addition, we offer a variety of ideas and suggestions, such as this article on setting up facility sound systems, that can help with event and operations management both on and off-site. 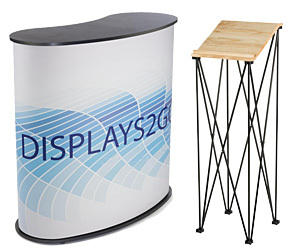 Displays2go is a one-stop shop for retail and commercial display merchandise. Have questions about fixtures, options, accessories, or ship times? Our customer service professionals are happy to answer questions, process order requests, and assist shoppers with any business related matters, and are easily accessible by phone, fax, live chat, or email.